Hurricanes defeat Rangers, James van Riemsdyk fined, injury updates, and more in today’s NHL morning coffee headlines. NHL.COM: The Carolina Hurricanes picked up their first victory in Madison Square Garden since 2010 by blanking the New York Rangers 3-0. Petr Mrazek made 27 saves for the shutout as his teammates scored all three goals in the third period. SPECTOR’S NOTE: With the win, the Hurricanes move one point behind the Pittsburgh Penguins, who hold the second wild-card berth in the Eastern Conference. NEW YORK POST: Before the game, the Rangers celebrated the 25th anniversary of their 1994 Stanley Cup championship. SPECTOR’S NOTE: Doesn’t seem like it’s been a quarter-century since the Rangers won their last Cup. There’s now a generation of their fans with no memory of their club winning hockey’s ultimate prize. Philadelphia Flyers winger James van Riemsdyk received a $5,000.00 high-sticking fine (Photo via NHL Images). SPECTOR’S NOTE: Glad to hear Keenan’s treatment was successful. 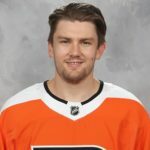 NBC SPORTS PHILADELPHIA: The NHL’s department of player safety fined Philadelphia Flyers winger James van Riemsdyk $5,000.00 for high-sticking Los Angeles Kings defenseman Alec Martinez. SPORTSDAY: The Dallas Stars placed goaltender Ben Bishop (upper body) on injured reserve. He’s expected to return to action on Tuesday against the Florida Panthers. NBC SPORTS BOSTON: Bruins defenseman Matt Grzelcyk (lower-body injury) is expected to miss today’s game against the Kings. WGR 550: Buffalo Sabres winger Sam Reinhart clarified comments he made about his club needing more from their goaltenders following Thursday’s 6-5 loss to the Hurricanes. “I got a call last night about what I said and at first I was rattled thinking something I said was taken the wrong way, then I watched it again and it came off the wrong way, so that’s on me, that’s not what I meant at all,” he said. Reinhart went on to praise Linus Ullmark and Carter Hutton.